Historian Kevin Brown and Ecologist Scott Cooper marvel at our great pinecone discovery. On a sunny autumn day in 2017, three ecologists and a historian stood at the top of Figueroa Mountain, a 4,534-foot peak in the Los Padres National Forest north of Santa Barbara. We should have been taking in the panoramic view, but instead we were staring up at a tall gray pine tree. How, exactly, would one go about extracting the nuts from cones 40 feet up in the canopy? It was a question none of us ever had asked before, and the obvious answer made me a little nervous. Further down the trail, a second gray pine saved us from ourselves. It had dropped a cone from high in its branches. The impact shattered its woody exterior, revealing the buttery nuts inside. This might have made a great snack for a grizzly bear. On the day we found our pine nuts, we were gathering food specimens as part of our work with the California Grizzly Study Group. Our goal was to figure out what grizzlies ate, and thus what roles they played in California’s ecosystems. In the library and online, we had scoured the historical literature for accounts of grizzly behavior. In the field, we were looking for nutritious snacks like berries, nuts, and roots that would be worth a grizzly’s foraging time. We know that grizzlies once roamed throughout California, including on Figueroa Mountain. Grizzlies are omnivores, and they probably ate a wide variety of foods. Some may have been mostly vegetarian, subsisting on grasses, tubers, fruits, and yes, pine nuts. Others may have been more carnivorous, fishing for salmon, scavenging on washed up marine mammals, or stealing deer and elk carcasses from the wolves and pumas that had done the hard work of hunting them. After 1769, grizzlies may also have feasted on Spanish livestock, which multiplied during the mission and rancho eras. The truth, though, is that we know little about how grizzlies lived in California. They died out before most scientists could study them. And the grizzlies that live in North America today inhabit places, like Yellowstone and Denali, which are very different ecologically from the Golden State. Understanding what grizzlies ate here is interesting from an ecological perspective; it is also essential for thinking about how to reintroduce and recover this species. If we were to bring grizzlies back to California, where would it be best to release them? How would they behave in the wild? Would they come into conflict with people? And would they survive? To better understand what grizzlies ate in California, our group is using a powerful tool called stable isotope analysis. Here’s how it works: Plants contain elements, such as carbon and nitrogen, in unique ratios depending the plant species and the environment where it lives. When animals eat plants, they incorporate these elements into their tissues—including hair, teeth, and bones. We can use the preserved body parts of animals to study the ratios of stable isotopes in them, and, by inference, the kinds of foods they ate. For our study, we are sampling bones and hair from California grizzlies, as well as some of the kinds of plants and animals these grizzlies may have eaten. Alexis Mychajliw poses with Monarch, one of our sample bears, at the California Academy of Sciences. In addition to working in the field, this project requires us to work in museums and laboratories. The first thing we need to do is find the specimens. While online collections databases make it easy to catch a first glimpse of the specimens available and where they’re housed, many have only the most basic accompanying information. Grizzly Group team member Kevin Brown has used his expertise in historical methods to unearth previously unavailable information about California grizzly specimens, including who collected them, when, and where. 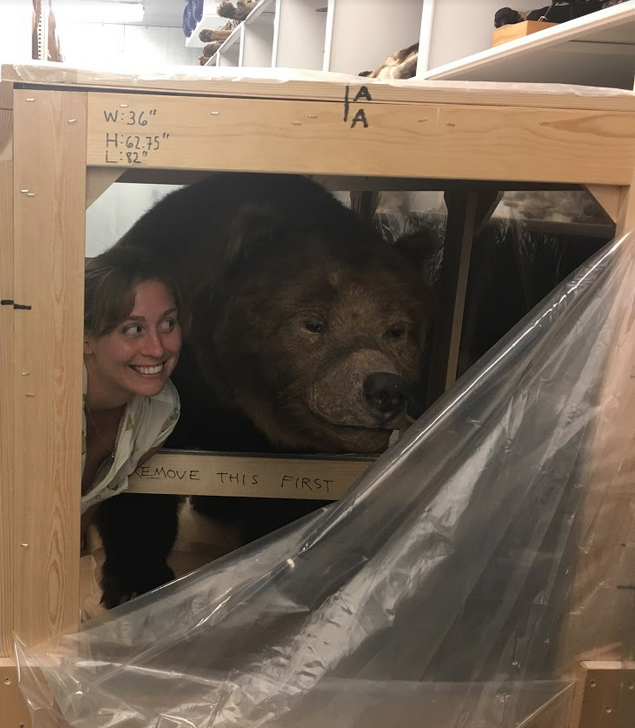 Alexis Mychajliw, a Grizzly Group team member and postdoctoral fellow at the La Brea Tar Pits Museum in Los Angeles, says that finding grizzly specimens is like tracking down a long lost relative: you never know what you're going to get. Sometimes the bears come to us. At the Tar Pits, Alexis often receives packages of dead animals. She opened one recent shipment to find half of a grizzly bear stuffed into two giant bankers’ boxes. After locating the grizzly we want to sample and receiving permission to use it, the next step is to collect a small portion of its bone using a tool that looks (and smells) like a dentist’s drill. We try to damage the bone as little as possible. If we have a skull, for example, we may aim for the delicate, curly bones inside the nasal cavity. Drilling into the bone creates a powder that we collect on a piece of wax paper and place in a small tube. We may also sample claws, teeth, or hair, in which case we either pluck it or grip a clump of hair and clip it next to the root. Then we go from the museum to the lab. We wash and dry the bear hair, and soak the bone in acid to extract the collagen. We also wash, dry, and grind our plant and insect samples down to a fine powder, either by hand with a mortar and pestle or with a ball mill. Once processed, our samples are ready to go into a mass spectrometer, which separates out the component elements and uploads the data. We then use models to identify patterns in our bear samples that match up with those in potential grizzly foods. These results should give us a better picture of what grizzlies ate in California prior to their extinction here almost a century ago. From the breezy summit of Figueroa Mountain to high-tech campus lab and the dark corners of the La Brea Tar Pits museum, our work is bring a key part the California grizzly’s story—how it lived and what it ate—back to life. More than a century ago, grizzly bears roamed over most of California, from the sandy beaches of Southern California to the fertile Central Valley to the foggy northern forests. Today, you can find California grizzlies on the state flag, coffee mugs, college campuses, and T-shirts, but not in the wild. It's a familiar story: people believed that grizzly bears threatened livestock and human safety, and they became a popular animals to hunt. It did not take long after the California Gold Rush of 1849 for grizzlies to disappear from the landscape—the last credible grizzly sighting in the wild was in 1924. Despite losing grizzlies in the wild, they’ve remained present in California's cultural landscape. And now, some groups are starting to think about bringing them back. One does not simply drive a truck full of grizzlies into the state, throw open the door, and say, “Welcome to California!” There is a lot to consider when reintroducing a species—especially when we’re talking about a 400-pound omnivore that has a long history of conflict with humans. One of the first questions we asked ourselves in the California Grizzly Study Group is: Where could a population of grizzlies survive in twenty-first century California? Mapping potential habitat for grizzlies in California requires that we consider a range of complex issues. As the most populous U.S. state, California boasts a human population of nearly 40 million. And these people like to drive. California has the second-most total road miles of any state, with almost 400,000. Bears and other wildlife face direct mortality from roads due to vehicle collisions. Roads also fragment habitat, breaking it up into smaller, lower-quality pieces, and enable people to access remote areas, bringing them into potential contact, and conflict, with wildlife. These issues are all the more challenging in a state that hasn't had any grizzlies for nearly one hundred years. When biologists map suitable habitat for a species, they often use models based on data from living populations. If there are no living populations in the proposed recovery area, biologists use current data from similar landscapes where the species still exists, or historic data from before the species was lost. California poses a problem both because it has changed so much in the past 100 years, and because it is very different, ecologically, from other areas where grizzlies live today. This gives us relatively little information from which to draw when building our models. What we do know is that grizzlies are ecological generalists that can thrive in a wide variety of environments. 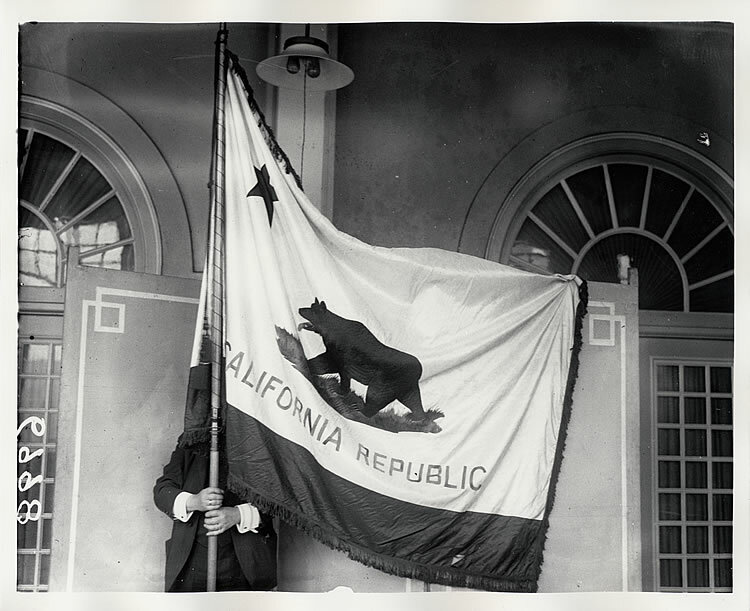 During the first half of the nineteenth century, grizzlies lived throughout the non-desert areas of California. Back then, most of the state was grizzly habitat. Today, large areas of the state—home to millions of people, acres of farms, and head of livestock—would be poor or unsuitable habitat, due to the high likelihood of these animals coming into conflict with people. Any map of potential grizzly habitat must take into account these potential conflicts, particularly in areas used for grazing, agriculture, and recreation. Even if grizzlies were reintroduced to remote areas of national parks or forests, some may occasionally wander into more populated areas, such as drought years when natural food sources are relatively scarce. Our method for identifying potential grizzly habitat thus focuses not only on ecological factors, but also on potential risks for grizzlies. To identify such risks, we are mapping rangeland, cropland, and roads, as well as natural vegetation. This integrated approach combines areas of ecologically viable habitat with areas of high risk for human-grizzly conflicts to produce a more realistic picture of where grizzlies might be able to live in California. It has the added benefit of identifying areas where social science research, public education, and infrastructure investments may mitigate potential conflicts. Humans caused the extinction of grizzlies in California, and humans remain the limiting factor in their reintroduction. With our research, we hope to show how grizzlies might interact with—and perhaps even thrive in—our modern California landscape. We expect to have results from our work in 2018. California grizzly bears are extinct, but they are not gone. I’ve seen the bones. In a windowless, climate-controlled room at the University of California, Berkeley, grizzly skulls, jaws, boxes of ribs and vertebrate, claws, and even a single molar each rest neatly on rows of metal shelves. There is a skull with a bullet hole over its right eye, another missing the side of the cranium, and one box holds a scapula with a curious nickel-sized hole through its center. Few of these animals died of old age. This room, at the university’s Museum of Vertebrate Zoology (MVZ), is a kind of evidence locker. It is proof of the violence that led to the grizzly’s extinction. But it is also an amazing resource to answer questions about how California grizzlies lived their lives. The California Grizzly Study Group is attempting to answer one such question. 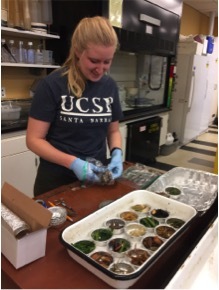 Using a method called stable isotope analysis, our group is using small bits of bone and hair from museum specimens to determine what grizzlies ate in California and how their diets varied over space and time. Before we were able to conduct our analysis, however, we needed to find a sufficient number of grizzly specimens. We also needed information about where and when these specimens were collected. This information is called "metadata." To find its specimens and metadata, the group called on historians, like me, who could serve as detectives. Since January of 2017, this has been my job. After eight months of searching databases, archives, reports, and letters, and after contacting two-dozen museums, I’ve learned just how precious that evidence locker at the MVZ really is. Of all the grizzly bears that ever lived in California—one estimate puts their 1850 population at 10,000 individuals—I have found remains from fewer than 80 individuals held in museums around the world. Of these, I only know for sure where and when 30 of these animals died. This is a frustratingly small number. How is it that so few representatives of California's official mascot—once the state's most abundant and formidable large carnivore—could just vanish? What happened to all the bodies? In August of 2017, I visited the MVZ, which houses the remains of 20 California grizzlies, a quarter of all those I’ve found in museum collections. I spent my time there consulting the MVZ’s records and files, and examining the specimens themselves. After two days of this work, I realized that I had been asking the wrong question. Rather than complain that so few grizzlies were preserved, I began to wonder how it is that we have so many. During the 1910s and 1920s, Grinnell and his staff produced a stream of correspondence with old-timers, ranchers, hunters, game wardens, foresters, and park rangers—anyone who might know something about grizzly bears or their remains. 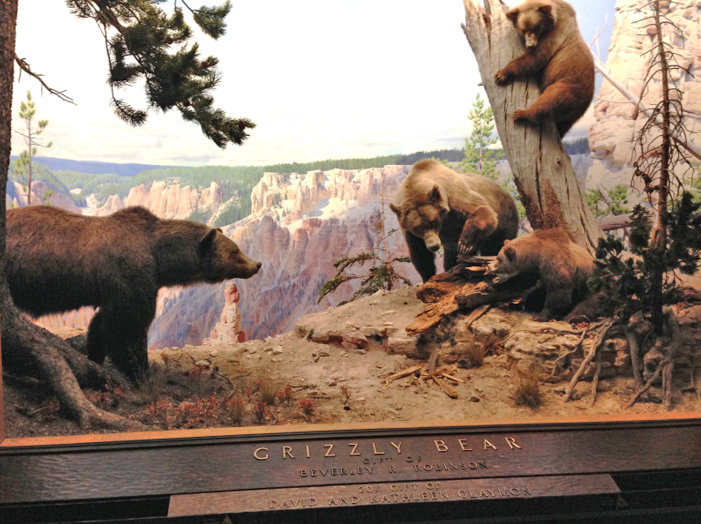 Despite these efforts, only twice during Grinnell’s tenure did the MVZ acquire a recently killed grizzly: once when the captive bear, “Monarch,” died in 1911 at San Francisco’s Golden Gate Park, and again in 1916 when the museum acquired the skin of the “Sunland” grizzly, the last grizzly killed in Los Angeles County. Most of Grinnell’s grizzlies came from his detective work. In 1912, for example, he followed a tip all the way to the junction of the Tehachapi and San Emigdio Mountains in southern California. A rancher there told Grinnell that sometime between 1893 and 1896 a grizzly bear was shot and killed after it wandered onto his ranch. The shooter earned a bounty of $500, and the bear’s skin was turned into a rug. Grinnell secured the rug’s donation to the MVZ, where it is still catalogued as specimen #16615. On another occasion, Grinnell acquired a bearskin from a grizzly that had been killed in the 1880s and displayed in a Yosemite area resort. Grinnell purchased both the skin and the story for $60. Even when he did not acquire a specimen, Grinnell often learned something new: the date of the last sighting in a particular valley, the method settlers used to hunt grizzlies, or the number of bears visible from a particular hillside in the 1850s. The bear disappeared without a trace, and the sighting marked one of the last credible glimpses of a grizzly in California. But even though the bears did not endure, Grinnell’s detective work represented a kind of salvage conservation. He could not prevent the extinction of grizzlies in California, but he could conserve some of the evidence they left behind. All those skulls, skins, and bones numbered, tagged, and arranged on shelves at the MVZ are more than dusty relicts: they are the product of decades of hard-boiled detective work. If my own efforts as a grizzly detective add up to anything, I hope that rediscovering these collections and using them for the Grizzly Study Group will also be a form of conservation. THIS IS THE FIRST in a series of audio, video, and text entries we will post on this website in the coming months by members and friends of the California Grizzly Research Network. The purposes of this blog are to provide a space for our group’s members to reflect on their experiences, and for readers to get a sense of what it’s like to participate in this ambitious project—the first major study of grizzlies in California in more than 60 years. To get us started, I thought I would offer a brief account of how this unique group came together. In 2013, I published a book on the history of endangered species in California. My first chapter discussed the epic story of grizzlies in this state. I described the species’ demise in California as a cautionary tale and a catalyst for other wildlife conservation efforts beginning in the early twentieth century. I did so, however, from the perspective of what I would now call “dead history.” Dead history is when the past is portrayed as potentially interesting, but not really relevant to the present. In the months that followed, I traveled around the state talking about my book. I was prepared to discuss desert tortoises, San Joaquin kit foxes, California condors, and delta smelts, but I was surprised when audience members began asking me about the prospects for bringing grizzlies back to California. The question seemed a little silly, but I decided that to put it to rest I needed investigate it further. In 2014, I was busy studying grizzly history, science, and conservation when the Center for Biological Diversity (CBD) submitted a petition to the U.S. Fish and Wildlife Service to list grizzlies in California and the Southwest under the Endangered Species Act, and launch a recovery effort. Currently, grizzlies are only listed in the Northern Rockies and North Cascades; they are extinct in California and the Southwest. How were the Europeans able to conserve brown bears and other large carnivores in human-dominated landscapes? And could California someday replicate the relative success of European conservation? Clearly, I had more to learn. I soon discovered, however, that my second question was impossible to answer because we had so little up-to-date information or analysis about grizzlies in California. In the spring of 2016, I convened a meeting on my home campus, UC Santa Barbara, to gauge interest in a collaborative project. More than two-dozen students and colleagues—historians, geographers, ecologists, political scientists, anthropologists, and education and legal scholars—showed up. By the end of that meeting, we had founded the California Grizzly Study Group. It has been just over a year since we began, and our group has made enormous progress. We have founded a diverse community of scholars able to support a civil, thoughtful, and evidence-based discussion on this topic. And we are working to provide a foundation of cutting-edge research for Californians interested in the past, present, and potential future of grizzlies in our state. We hope you return to this site regularly to get updates on our progress, learn about our results, ask questions, and make recommendations that will inspire further work.